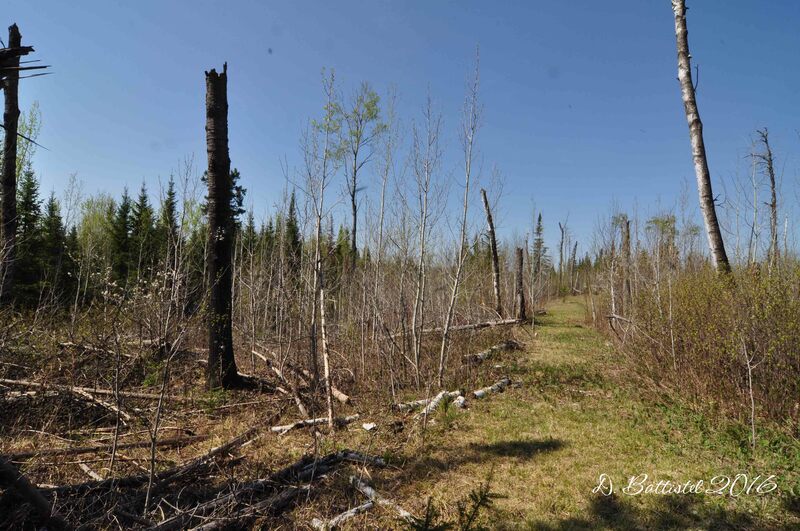 La Verendrye Provincial Park | Poverty, Agony, Distress & Want! Picture it. Three intrepid explorers, probing the wilderness of the Canadian Shield while battling the elements and conditions. It is a test of wills and endurance; a modern version of the Revenant if you will. Makes for an interesting story does it? Come on! Did you forget who’s writing this? It’s more like a dumbass dad and his two sons blundering around in the outdoors all the while being swarmed by hordes of blackflies. Sound intriguing now? Wait until I tell you the while story! So here we are nearing the end of May? Where did the time go? Time does move faster when you’re on vacation. I have been making good use of every moment though: I can say that I’m almost too busy. There are way too many things to do, inspite of the fact that I am on sabbatical. What have I been up to you ask? Well, if you recall from my last post, I was a few days away from a trip to Toronto and my brother’s wedding. As you can imagine, that week flew by in a heartbeat. It was a great time, but insanely busy. It was an honour for my family to part of this event, and if I do say so we quite a good looking bunch all dressed up. We also had some family visiting from Italy, so some time was spent showing them around the city, which is ironic since I was a tourist too. Part of my plan for this visit to the provincial capital was to sneak away for a few hours and look at some files at the Archives of Ontario. It was quite an interesting mix; a map, some photos and an Order in Council. What I thought would take me a morning took me less than an hour to get through. The map answered a few questions and the photos were very pretty cool, having been taken during a highway survey along the railway right-of-way in 1930. 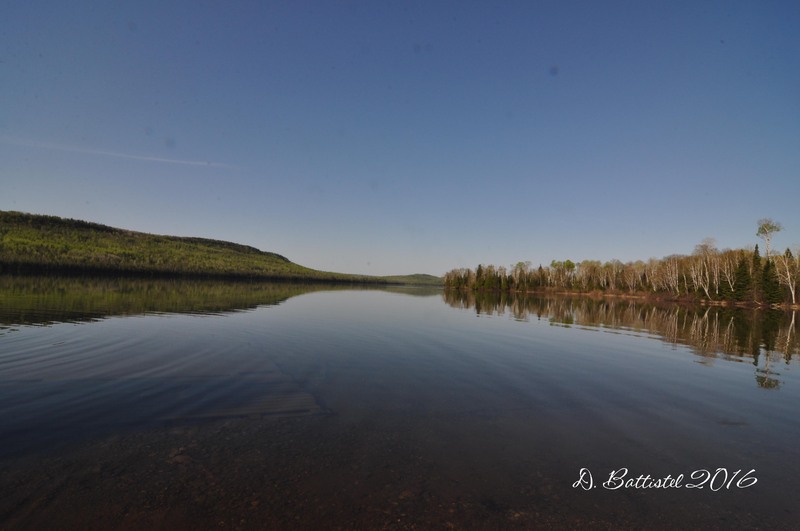 There were shots of Mackies, the rail line and narrows between Little and Big Gunflint Lakes. The Orders in Council, there were actually two, provided the biggest challenge of the day. I first had to locate the docket number from a microfilm in the reading room. I thought it would take me forever, but mercifully I happened on the right page after a short search. Then I had to request copies of them and then have them emailed to me. Both documents, dated 1900 and 1903 respectively, related to the Pigeon River Lumber Company receiving permission to do business in the Province of Ontario. Not anything I didn’t know, but important information nonetheless. Since returning from TO, I’ve kept my nose to the grindstone with projects around the house. 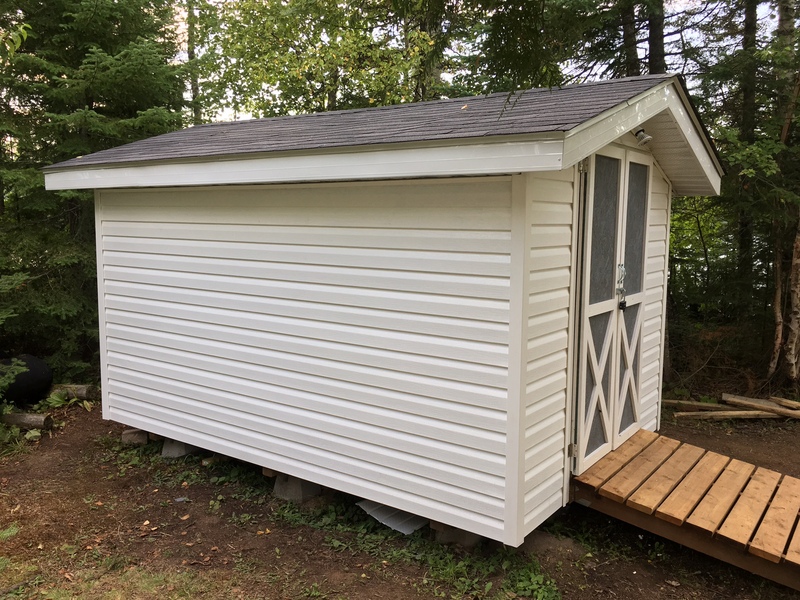 Our office is almost done-it’s just waiting for a final coat of paint on the door and then the installation of the pocket door latch. My wife then decided that she needed to do something about the lack of counter space at camp; cue Pintrest…again! So we’ve been looking for a while for the right dresser that could be converted into a kitchen cart. Turns out, we had one right here. It’s taken a little bit of work, and a few bucks, but when it’s done it should look pretty good. We ordered a countertop for it today and its paint transformation will begin tomorrow. I’ll post some pics when it’s done. 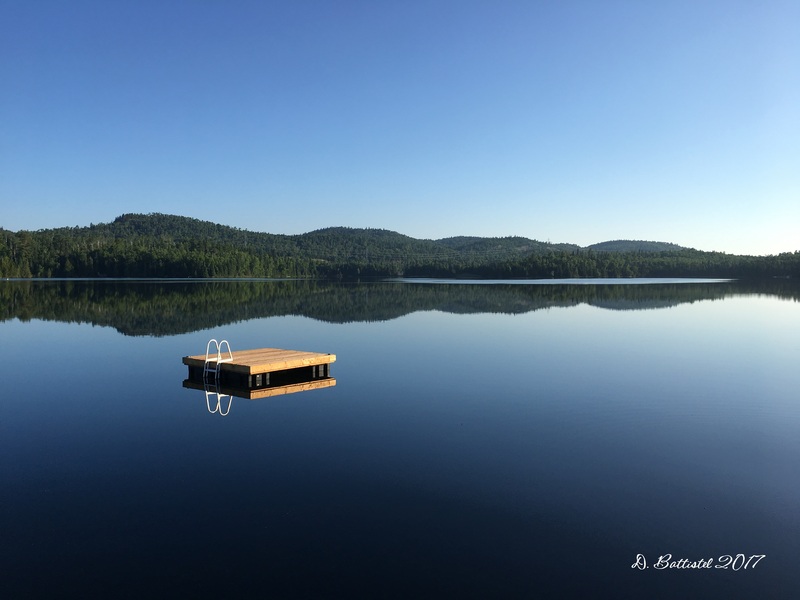 Now speaking of camp (yes, camp…let’s not have this conversation again), we have been spending a bit more time out there as we move toward summer. This winter we inherited the camp from my wife’s parents and we’ve been doing clean-up work and some upgrades. Last Friday we brought a new fridge out to supplement the original tiny 11 cubic foot one that was way too small for our needs. We were back on Sunday to Monday cutting down a big pine tree in the yard that was slowly dying. Using the chainsaw made me feel very outdoorsy, though I did learn an important lesson; don’t cut pine trees without long pants on. Really, I should have been wearing long pants from a safety perspective, but it was bloody hot on Sunday and I was trying to keep cool. What I ended up with however, was sap stuck to my legs and leg hair. Rubbing alcohol usually gets it out, but since we didn’t have any out there, I tried a bit of vodka. While my logic seemed sound, the execution left a lot to be desired. Second lesson learned! Sandwiched in between those visits to camp, was my first hike of the year. Yes, I finally got out there after months of talking about it and boy was it a doosy! I think you might have gotten that impression by my introduction, but I guess I should elaborate. 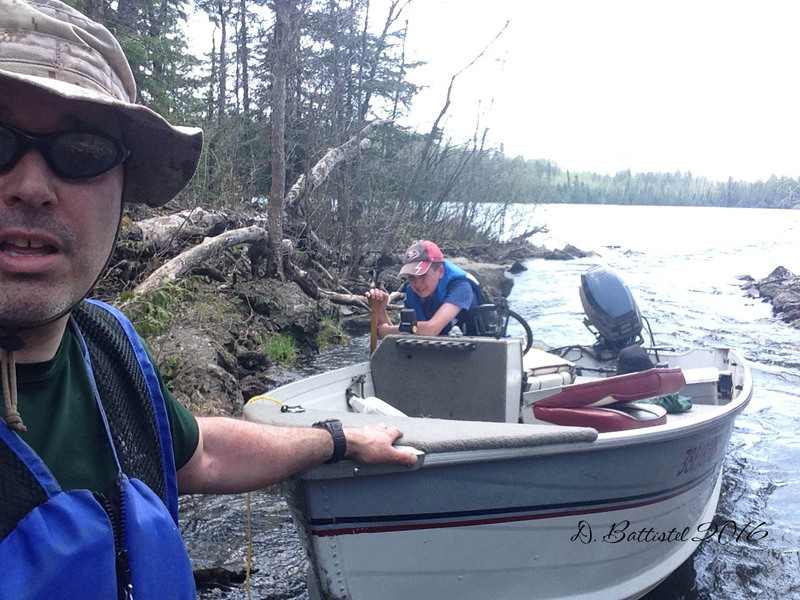 The plan for my first piece of field work of the season was to travel to the east end of Gunflint Lake, staying on the Canadian side of the border. 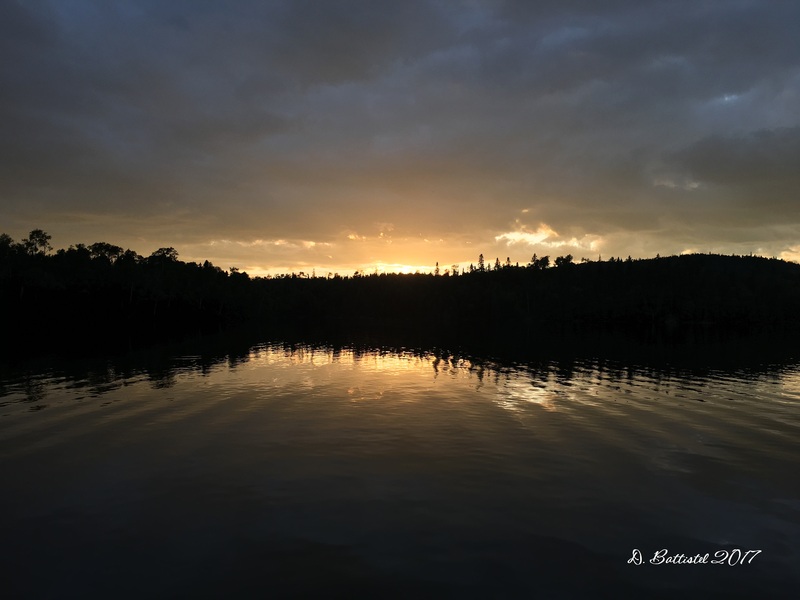 Since I was staying north of the international divide, I thought it would be easier to get there via North Lake than travelling into Minnesota and directly into Gunflint Lake. The drive is a bit shorter, though it probably works out to be the same since the boat ride is much longer. 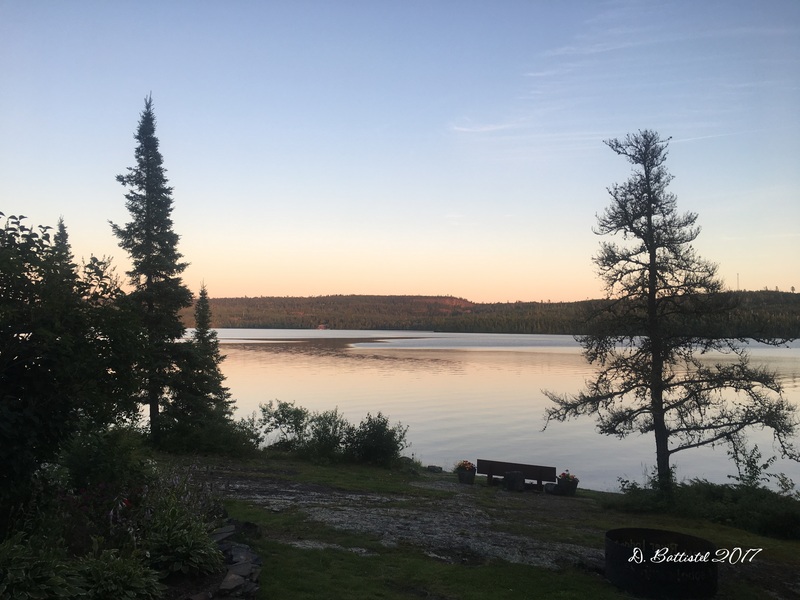 Speaking of which, getting to Gunflint from North Lake is a bit of a challenge, as you have to cross not only North Lake, but then Little North and then Little Gunflint before you reach Big Gunflint, a distance of nearly 11 kilometres. We arrived at North Lake by 9am and quickly had the boat in the water. The first thing we noticed, or rather was impressed upon us, was the clouds of blackflies in the air. It was unbelievable how bad they were. If you’ve never had to deal with blackflies before, count yourself lucky. Anyway, within a short amount of time we were zipping across the fairly calm waters of North Lake and were making good time. The first trail of the journey comes when you enter the narrow channel separating North from Little North. With Ontario on one side and Minnesota on the other, the waterway is less than 70 metres wide at points. At its end, when you enter Little North, it drops to 25 metres and is very shallow, necessitating a cautious approach. 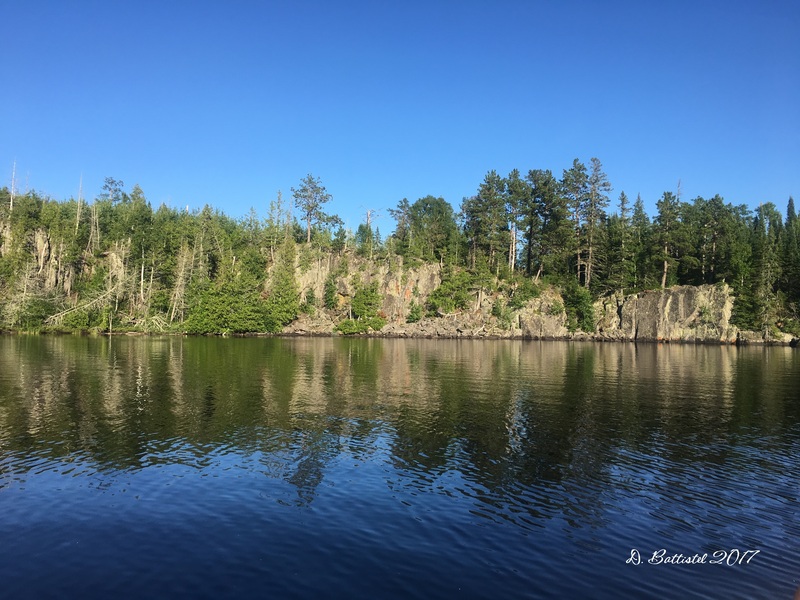 You can pick up speed on Little North, but it’s only over a kilometre to the portage to Little Gunflint and there are rocks in the water, so you need to be careful. 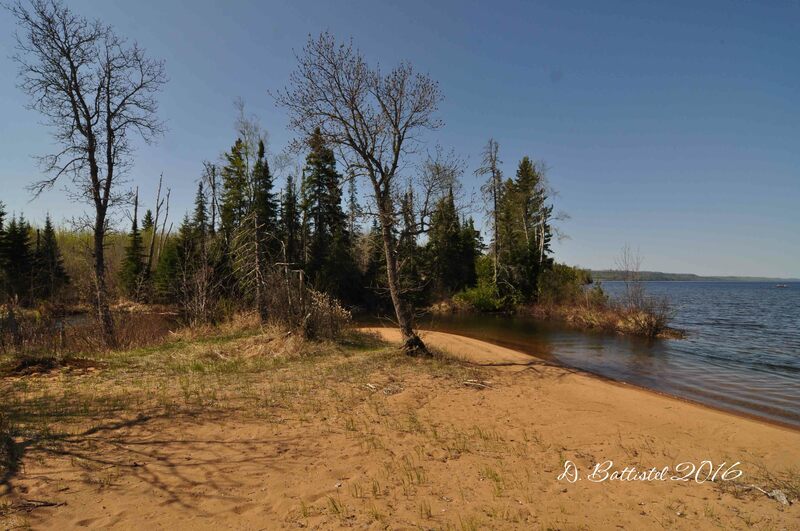 The watercourse that separates Little North from Little Gunflint is extremely narrow and runs for about 50 metres. It is little more than a creek, and due to it’s location over the continental divide, its waters run west, eventually making their way into Hudson’s Bay. The creek itself appears to have been modified by human hands, most likely in 1892 during the construction of the railway. 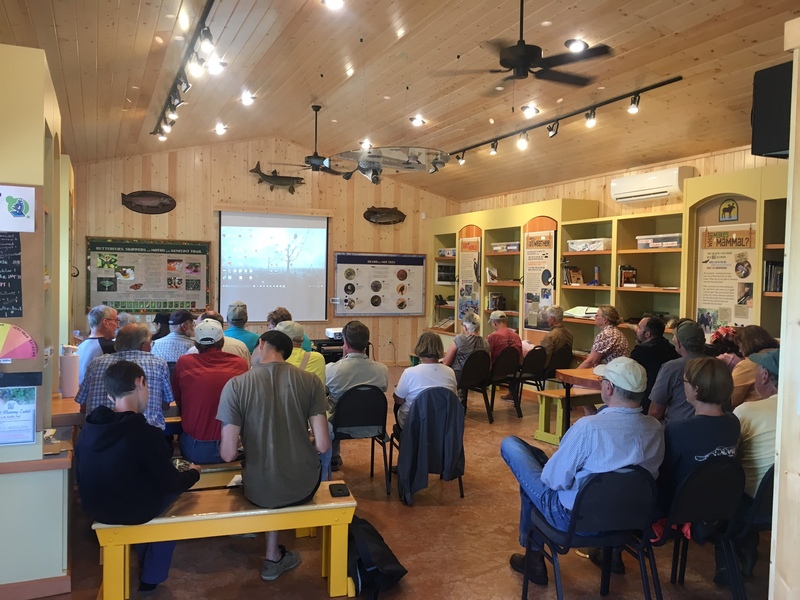 From our best understanding, the engineers laid down a small marine railroad on the Minnesota side of the narrows, which, using a small cart and capstan, were able to haul boats and supplies from one lake to the other. It was maintained by locals until the early ‘70s, but now sits as a stark reminder of the labours of centuries ago. 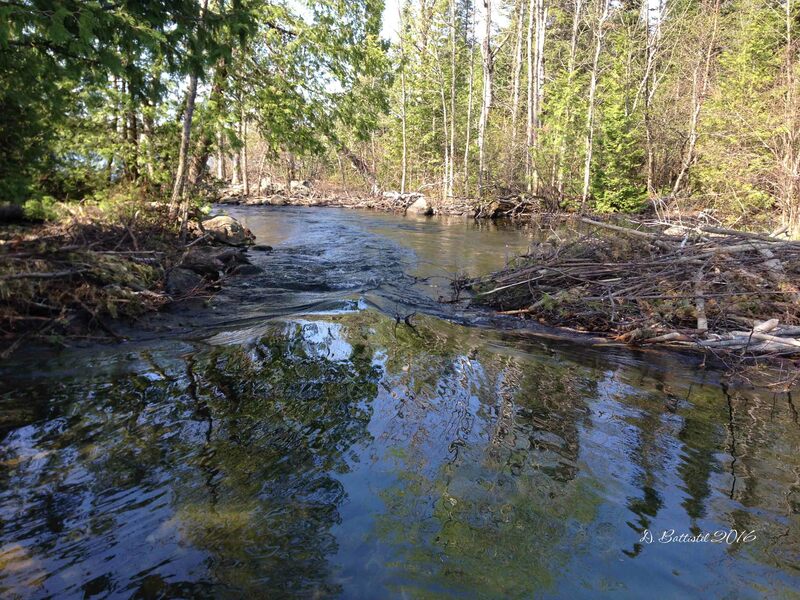 I’ve been through the creek when there was less than a foot of water in it; this time, given the fact that it is spring and there was an attempt by a beaver to dam it, several feet of fast-flowing water courses its length. It made for a crazy, bumpy and somewhat concerning journey downstream. Little Gunflint was much less dramatic, though there are several rocky and shallow sections that require a slower speed. My course of action for the visit was to walk the 400 metres of the Gunflint & Lake Superior in Ontario (technically it was only branch of the Canadian Northern since the G&LS started in Minnesota) and explore the location of the Canadian customs houses near the grade. The land in this area is actually privately owned so I had to check with the new owner to do this work. I’ve walked the Ontario portion of the G&LS grade many times before, the first time was back in 1994. However, I’ve never been there without leaves (or many leaves), so I was curious what I’d see. It was pretty warm as you moved away from the lake, and of course the blackflies were swarming anytime you stopped. I didn’t take us long to get to the PAD&W grade and then start working our way back. 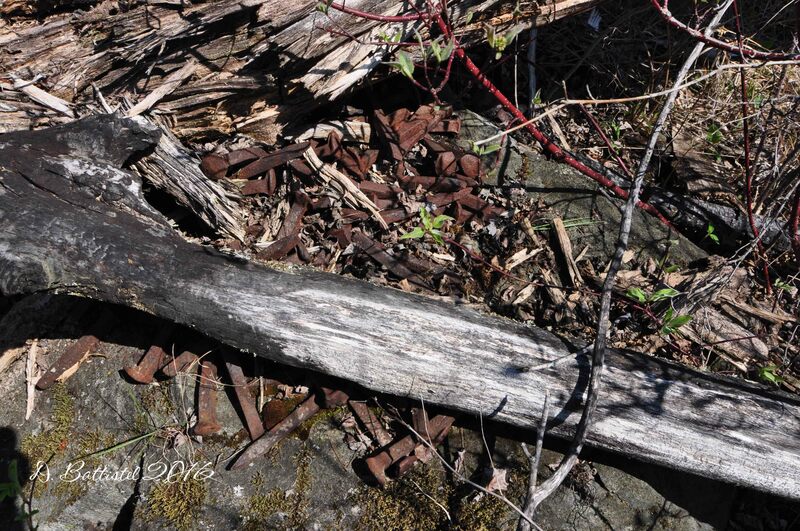 We came across a neat pile of spikes, which made me wonder if it was done when the rails were being removed or later. Little-Big Gunflint Narrows, May 2016. When we returned to the beach, the boys decided it was lunchtime and I pulled out the metal detector to see what I could turn up. My first area to explore was the point of land where the two lakes meet and where the G&LS crossed into Minnesota. I wasn’t really holding out hope of finding anything, but as it turns out I made a critical discovery (actually two). If you read this blog on a regular basis you’ll know that one of goal of my field work on the G&LS is to discover how far the telegraph line extended along the line. Last year I found a coil of wire on the Little Gunflint, though I could not find any evidence near the junction of the two railways. After turning up a long-lost tent peg, I uncovered a 50+ cm length of what I believe to be telegraph wire (I didn’t excavate the whole thing). 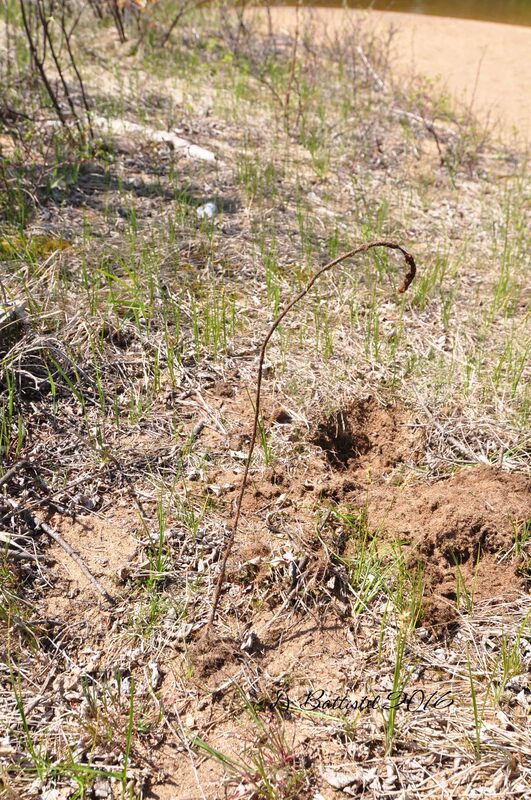 Working off of that, I found another section of wire several metres further back on the grade. So I think I can say with some certainty that the line at least crossed into Minnesota. After that, I turned my attention a little way up the beach to the north to where two buildings were once located; I presume that they were once the Canadian customs houses while the railroad was in operation. I’ve never really explored this site before, so I was curious what I would turn up. The detector immediately lit up and I could see several depressions in the ground. I’m not a trained archaeologist, nor do I want disturb any potentially important artefacts in the ground, so I treaded very lightly. I picked one spot and carefully dug down several inches to see what was there. What I had stumbled upon was either a garbage pile or a fire pit. 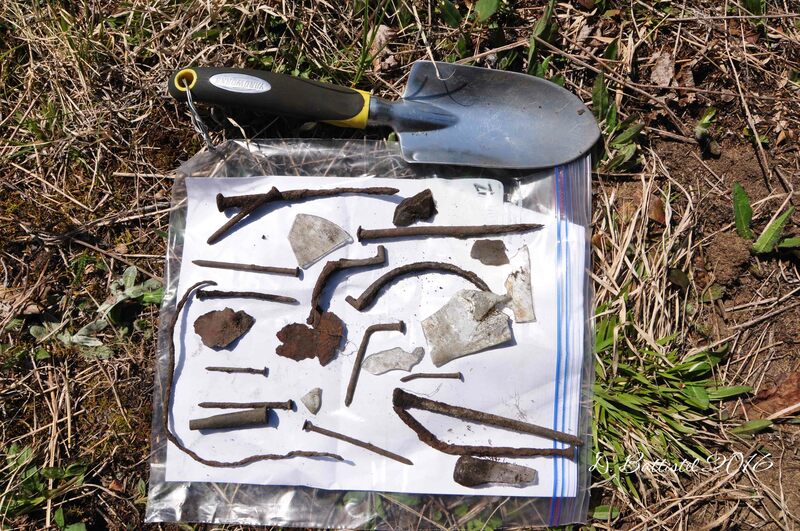 There many nails of various sizes, assorted bits of metal and iron, pieces of glass and even a spent rifle cartridge (.30-30 I think). Some of the glass appeared to be fused together, which is why I thought it might be a fire pit. After photographing the items, I returned them to the ground; hopefully I can get some real archaeologists to the site to do the job properly. All in all it was a successful trip, but the fun didn’t really start until the ride back. When we reached the aforementioned Railroad Portage, I then realized the challenge it would be trying to get the boat upstream into Little North. I thought I could pull it along the shore but the current was having nothing of it. Even jumping into the frigid, waist deep water to try to move it along did not help. It was going to be tough. My next move was to lose some weigh, which meant putting my youngest, Noah, ashore. He became quite upset, convinced that we were going to be stuck there. Unfortunately that didn’t help much; the current was still pushing the boat back and on to the rocks. I was getting tired, the blackflies were eating us alive, and my oldest, Ethan, was even getting a bit rattled. It wasn’t until I decided to use the anchor rope to secure the boat farther upstream that we started to make progress. It took us more than 30 minutes, a ton of exertion and a bunch of bruises to get through. I learned a valuable lesson that day; never go though that creek in the spring…and I have all the blackfly bites to prove it. Stuck in the creek, May 2016. I told the boys on the final leg of the boat ride back that they would remember days like this one many years from now. The more eventual trips with my dad are the ones that stick out in my mind. They can look back with fondness on all the stupid stuff their dad got them into, even though at the moment it didn’t seem so humorous. Honestly I was a bit concerned for a few moments myself, but hey, a little excitement makes life that more interesting. I’m sure there will be more well though-out moments in the future.